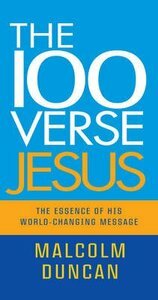 100 verses specifically about Jesus: Malcolm Duncan brings his succinct, focused commentary to explain the context and essence of each verse, allowing the reader quickly to get a clear sense of who Jesus was, said, did and is. This book will be ideal as a reminder to believers of just whom it is that they serve and follow; it will also serve as a primer for those new to the faith, and as an introduction for those who are skirting the edges of belief. About "The 100 Verse Jesus"
Previously Head of Mission at Evangelical Alliance, Rev. Malcolm Duncan is now Movement Director at Faithworks. An Elim minister originally from Northern Ireland, he is a prolific speaker and writer. He has most recently written Kingdom Come: The local church as a catalyst for social change and Building A Better World . Dr Mark Stibbe studied English Literature at Cambridge University and then went on to study Theology at Nottingham University, before being awarded a PhD. He has authored more than 40 books and is the CEO of Kingdom Writing Solutions.